A new DA has been submitted to construct a 20 level residential building located at 66 High Street, Toowong. Designed by Rothelowman, the building comprises of 154 residential units and 308 square metres of Shop / Restaurant floor area. 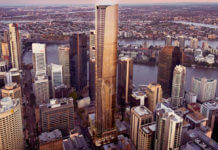 According to the DA, the design concept for this project has been derived from an analysis of the site locale and its position within the greater context and particularly the connection with Mt Coot-tha and Taylor Range. It is recognised that the building will be highly visible from the surrounding areas due to the elevated position at High Street Toowong. A singular approach has been adopted for each of the tower elements to enable them to read as elegant slender structures when viewed from a distance. The project includes a 259sqm ground floor retail tenancy and a rooftop pool and bbq deck on level 19. The DA number for this development is (A003891937). Is there NRAS apartment ? Are these apartments ready to rent now and are they NRAS?